It has been a spectacular autumn for colour. In bright light, the reds, oranges and yellows have been rich and brilliant. 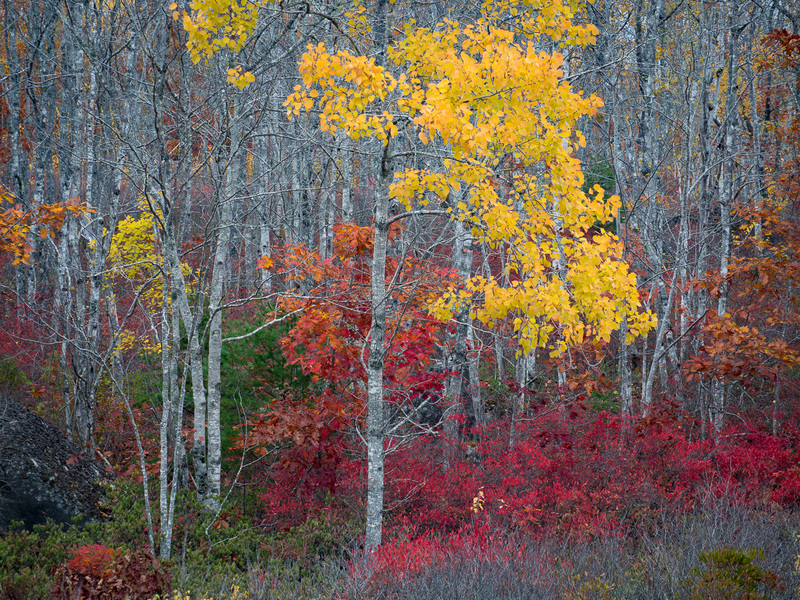 Last week, during a trip to Shelburne, it was evident that the peak had passed, but there were still signs of fall. I took this image right beside the highway. Here and there, the underbrush was fiery red and bright yellow; in other places, it was denuded gray. Most of the tree leaves had also fallen, leaving behind grey trunks. But, the occasional tree still flashed colour. Landscapes such as this can be challenging to photograph. There is massive detail, often chaotic, and making something out of it doesn’t always work. A lone tree in a barren field is a much easier compositional exercise, and that’s why photographers (myself included) are automatically drawn to such a scene. It’s easier to create a successful image. Here, I looked at the colour blocks – red, yellow, grey and brown – to guide me. I was aware of the detail in the scene and, frankly, worried about it. It wasn’t until I looked at the image on my computer that I truly appreciated how it contributed to the image – especially an image of roadside brush in Nova Scotia. Because that’s how it looks – thick, and chaotic, and beautiful.